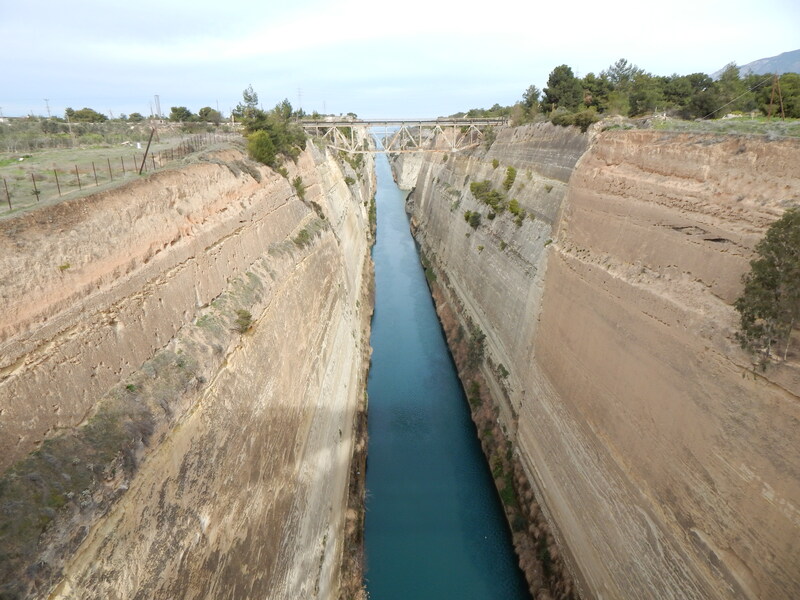 The canal is is 8 meters deep, 21 meters wide, and 6343 meters long. The walls stretch 79 meters above the level of the sea. Next, we visited the archaeological site of Mycenae. The Mycenaean civilization was the first major civilization of Greece (and Europe, in fact). The citadel we visited was inhabited during the Bronze Age and, at its peak in 1350 BC, the citadel and area outside the walls was occupied by 30,000 people. The famous “Lion Gate” is the main entrance into the fortified walls, which are built in the Cyclopean style, called such because the stone blocks are so large they could only be moved by a cyclops. Each site we visited was covered with spring flowers. 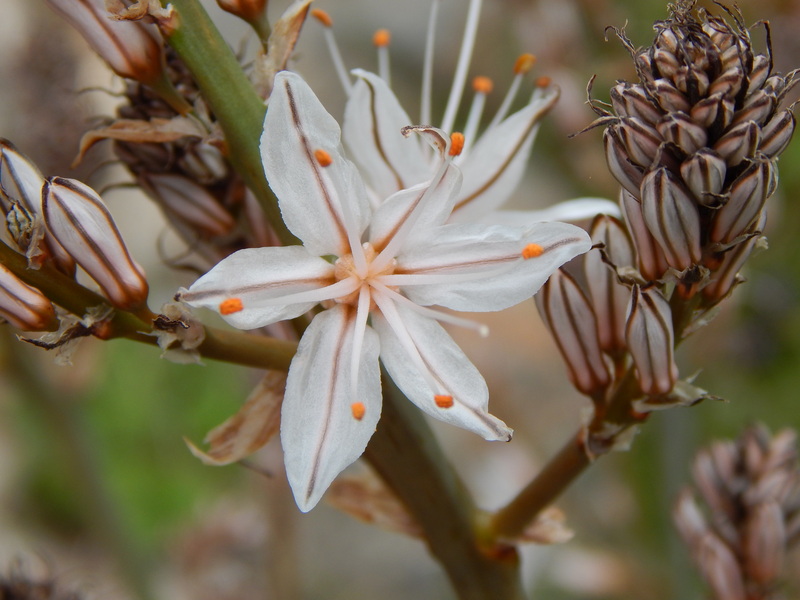 Here is a flower from Mycenae. On Thursday we visited Mystras, a fortified city near Sparta. The city was built in 1248 AD. 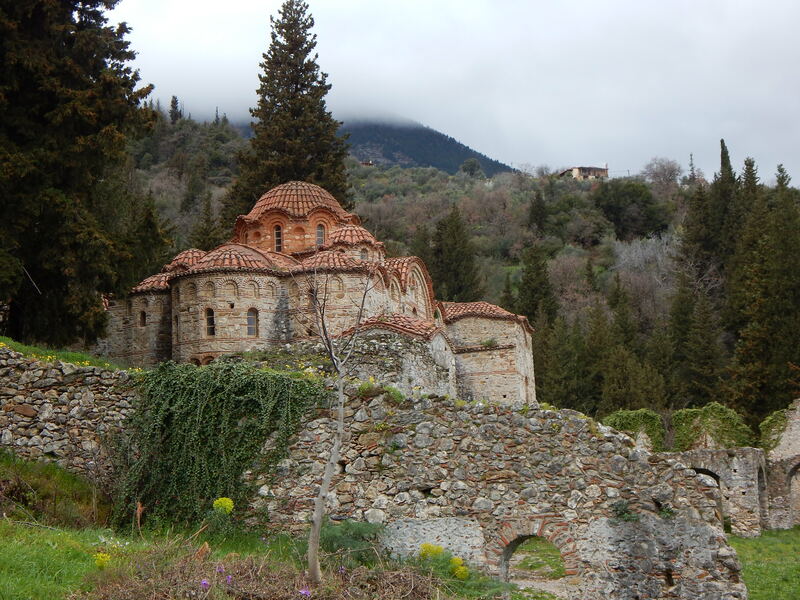 Panagia Hodegetria – one of many churches in the walled city of Mystras. 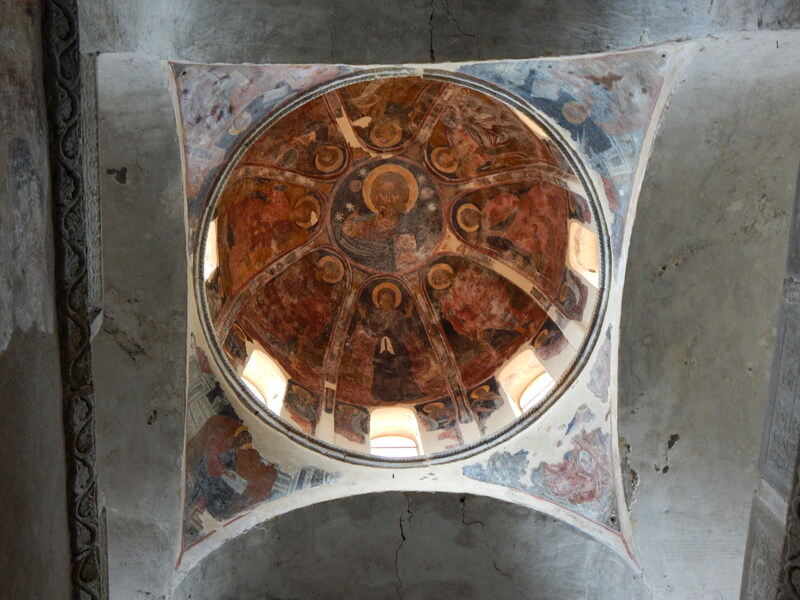 Churches with domes often have a Pantokrator – an icon of the all powerful Christ. The word ‘pantokrator’ means all powerful. This particular Pantokrator is a fresco surviving from the Byzantine period. On Friday, we went to Pylos and visited the Palace of Nestor. This was another Bronze Age Mycenaean palace like the first one I described. Here, 1000 tablets written in Linear B were found. Linear B is a syllabic type script and is the earliest form of the Greek language. These tablets were used to record receipts and business transactions, not specific people or events. In fact, these tablets are usually wiped clean after a month and used again to record more business transactions. The reason so many tablets were found at the Palace of Nestor was because the palace was burned down in 1200 BC and the clay tablets were essentially ‘fired’ like clay in a kiln and the script remained until 1939 when the tablets were discovered. After visiting the palace we went down to the city and had lunch. 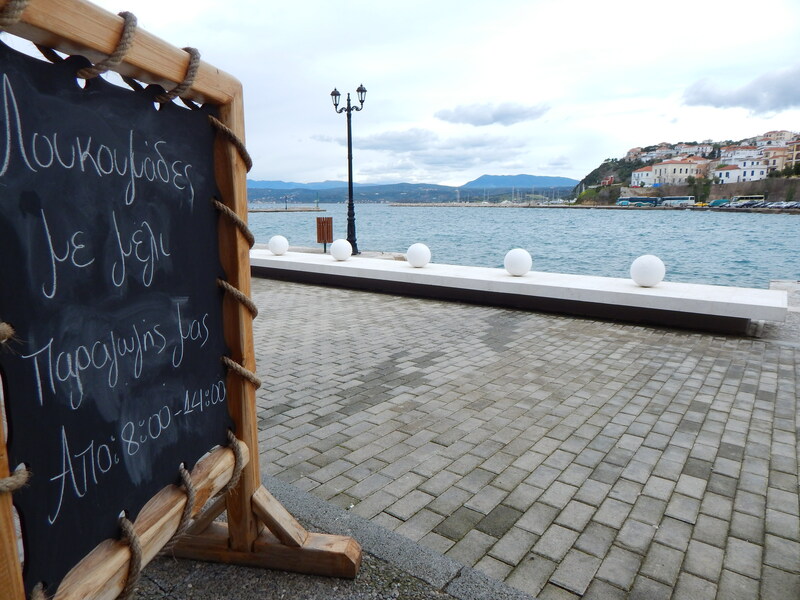 Lunch on the sea in Pylos. This sort of view is what one imagines when one thinks of Greece! On Saturday, the last day of the trip, we visited Olympia. 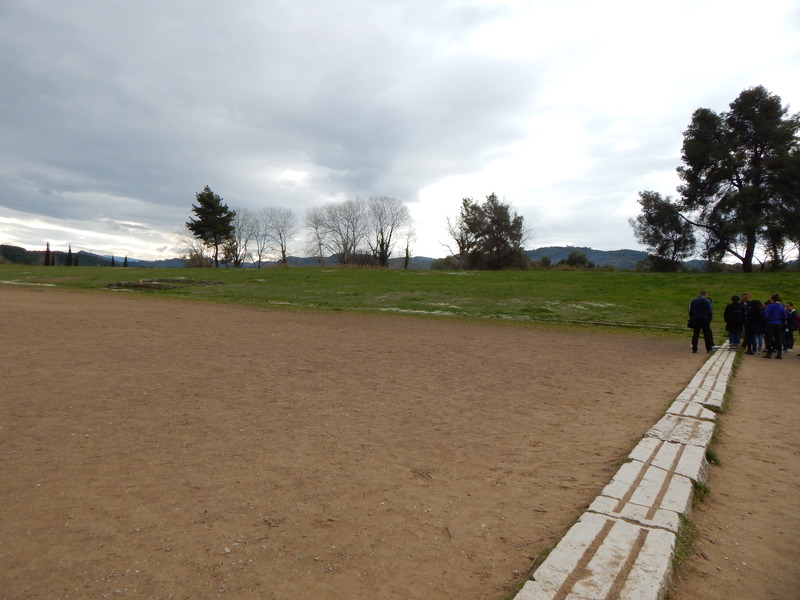 Here, of course, is where the very first Olympic games took place. I got the chance to run a foot race through the original Olympic stadium. I did not win, which means no statue was erected in my honor as it was for ancient winners. Near the entrance of the stadium was the “Hall of Shame.” When an athlete cheated in their sport, they were forced to pay a hefty fee. This money was used to erect a huge statue of Zeus with the cheaters name inscribed underneath it. In this Hall of Shame we saw the bases of twelve Zeus statues. Poor guys, still being publicly shamed 2500 years later. Here is the original starting line of the Olympic games. The stadium did not have stone seating except for the few seats seen in the far left which were reserved for officials of the games; everyone else sat on the grass. That’s all for now. We visited many more sites and museums than I could include in this post, but I wrote about my favorites. Each place was more interesting than the last (except the olive oil museum which was an alternate plan since we got rained out…they didn’t even sell olive oil there!). Regardless of the rain, we had a very busy week. Now I must get back to work, as mid term exams are about to begin. Did you forget that I’m also taking classes? Me too. With memories of the sea and the wide open spaces I suppose I can endure one week of classes until our next field trip to Delphi on the 17th. Three cheers for the CYA and their wonderful field trips!